What is the Solaqua Solar Gem Car? 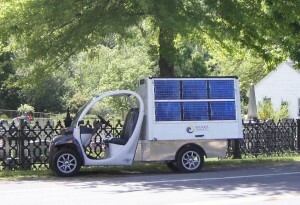 The Gem car with sides down showing one side of the photovoltaic panel array. A Gem Car is an electric vehicle made by Global Electric Motorcars (owned by Chrysler Motors). These low speed street legal, light utility vehicles are used extensively at resorts and hotels, college and corporate campuses for hauling and passenger transportation without the noise and emissions that come from gas powered vehicles. 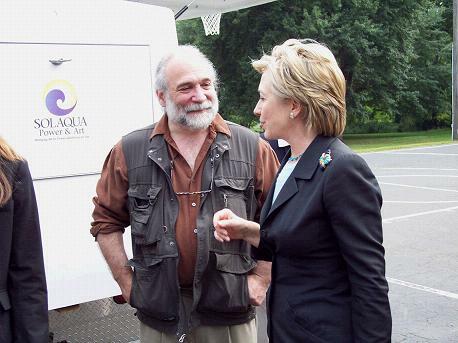 Jody Rael, Solaqua’s President, purchased our Gem car in 2005 with the intention of charging it with solar power and outfitting it with solar panels to power an amplification system. A music lover since his teenage years, Jody had already created a few solar powered public address (PA) systems but this would be the first truly portable system. 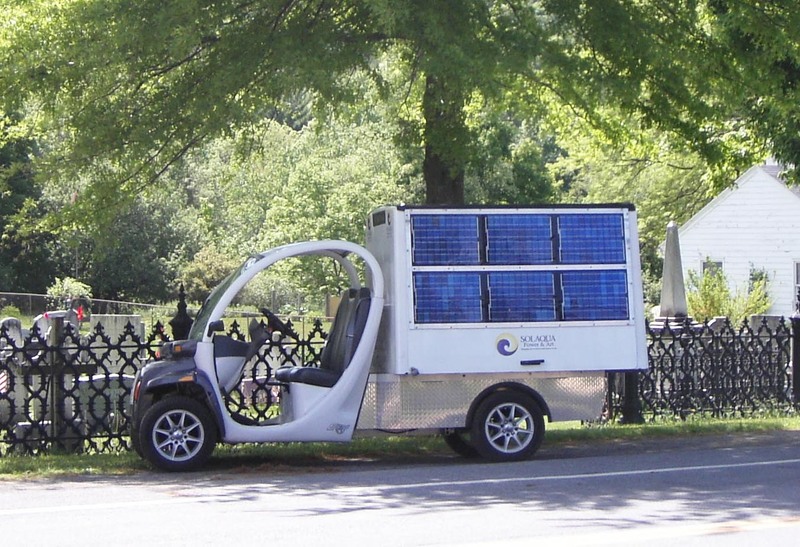 The Gem car’s PA system is powered by twelve 50-watt photovoltaic (PV) modules positioned on both of the wing doors. The state-of-the-art PA system provides a mobile, stand-alone, concert-quality, sound system perfect for festivals and events. Since acquiring and outfitting our Gem car, it has been used for educational outreach programs, fund and awareness raising events, fairs and concerts. 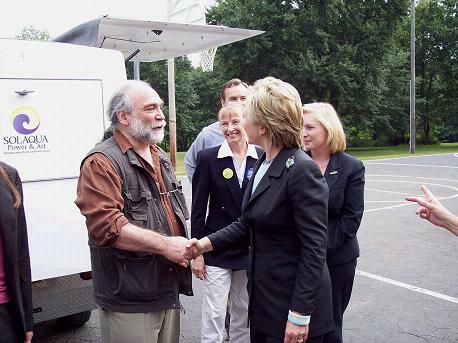 Our Gem car has even amplified former Secretary of State Hillary Clinton, when she was campaigning for the office of New York Senate in 2006! Former Secretary of State Hillary Clinton speaks with Jody Rael, President of Solaqua. 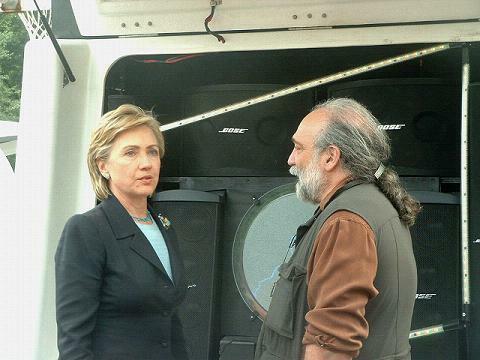 Jody tells Hillary that her speech will be amplified with solar power! Hillary talking to Jody about the need for solar power in the United States. Solaqua also owns two other electric minivans (circa 1980’s) that we are in the process of refurbishing. Do you need space to pursue a sustainability project? Inquire about space at Solaqua. “The genius of Solaqua lies in its merging of compatible-not competitive-interests: employment, tourism, the environment, architectural re-use, alternative energy, the arts."